It can seem like a big time investment to learn how to type faster, especially if you’re a proponent of the hunt and peck method — also known as looking at the keyboard to find each individual key. But improving your typing skills can save you a lot of time. It’s considered average for a computer user to be able to type between 30 and 35 words per minute. With a little training and practice, however, it’s possible for most people to get up to between 50 and 65 words per minute, sometimes doubling their speed. Experienced typists may reach average rates of anywhere between 80 and 120 words per minute. Even if you don’t hit that level, you can probably improve your typing efficiency. The key to learning to type faster is to know what keys are at your fingertips without having to look down. Being able to recite the layout of your computer keyboard isn’t just a fun party trick. When you know the layout of a keyboard by heart, you can touch type — and from there, improving your typing speed is a matter of practice more than anything else. You can take classes in typing, but it can be more useful to use training software, because you won’t be tied to an instructor’s schedule. Mavis Beacon Teaches Typing is one of the better-known typing software packages, and Typing Instructor is good as well. Most computer users rely on the mouse to interact with computer programs. In fact, the mouse and the visual interface that most of us are used to were key to making computers mainstream. But if you want to be particularly efficient in how you use your computer, you need to learn the keyboard shortcuts. Every piece of software and even many websites have their own shortcuts. You can also go into your computer’s settings and modify shortcuts to your own preferences. Because they can vary dramatically, I can’t just give you a list of the different shortcuts out there. But if you search online for a particular software package or website’s name and the word "shortcuts," you can find a list of what's programmed. This table of common shortcuts can also give you a start for the more common operating systems. The trick to getting full benefit from keyboard shortcuts is to make a point of using them instead of your mouse. You’ll get a lot faster, to the point that typing a shortcut is automatic when you want something to happen, rather than having to shift your hands to the mouse and hunt around for the right menu. One word of warning — you may get so used to using your shortcuts that moving over to a new kind of computer with different shortcuts can become that much harder. There are a variety of software packages that can help you speed up your typing beyond just learning to type faster. My personal favorite is a tool called TextExpander, which lets you create shortcuts of your own. I’ve created a few shortcuts to help me use software faster, but most of my shortcuts are actually for typing — for instance, I type one shortcut and TextExpander automatically replaces it with my name. Another expands into my address and so on, for a few hundred different shortcuts. There are also dictation software packages, which allow a computer to transcribe whatever you say into a text document. The best software, such as Dragon Naturally Speaking, requires you to train it to better understand your speech patterns before it can provide accurate transcriptions. But once the software is used to you, it can be very effective. With it, you don’t need to worry about speeding up your typing speed at all. 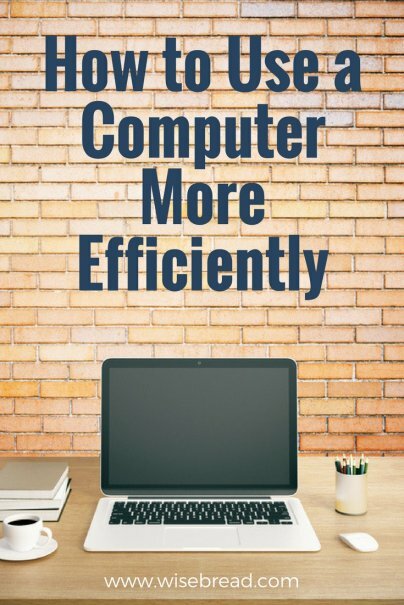 There are a variety of tools and techniques out there that can help you be more efficient on the computer, but you’ll get the most out of them by investing some time up front. I remember when I first learned how to use keyboard shortcuts -- it was during a freelance assignment that required a lot of meticulous, tedious cutting and pasting. I was really shocked by what a difference it made using the keyboard versus the mouse. I'm a really fast typer and know most shortcuts - when I work with someone who types slowly or doesn't know shortcuts, I get sooo frustrated (even when that person is my boyfriend!). I have to remind myself that it's "normal" and if I'm honest, I'm the one who is abnormal. :) I do think it's something definitely worth learning though. I actually did work at QVC for a little while -- it was my first job out of college. While they have some pretty unnecessary stuff (like, well, most retailers), I will say that they also have some high-quality products at decent prices. I bought pillows, food storage containers, and make up from QVC that I was really happy with. As a programmer or working with plain text documents vim or emac editors can make a world of difference. There is a steep learning curve, but once you know it you can do so much faster. You can get vim plugins for everything including a browser. Also, I find switching the Ctrl and CapsLocks keys helps me out a lot. I never use CapsLocks and it has prime real estate on my keyboard.